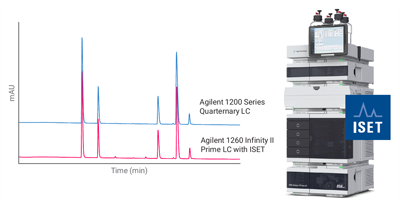 A conventional analytical method for the analysis of antihistaminic drugs was transferred from the Agilent 1200 Series Quaternary LC to the 1260 Infinity II Prime LC. By enabling ISET and using the fine-tuning option for the 1260 Infinity II Prime LC, excellent agreement of retention times with a deviation below 0.5 % was obtained. In addition, by transferring the analytical method, the precision of RTs and areas was improved, and the 1260 Infinity Prime LC demonstrated best in class performance. 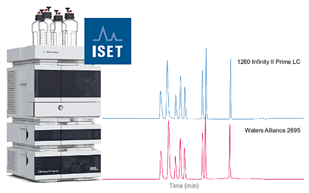 By enabling ISET, the emulation of a Waters Alliance LC is possible, even running concave and convex gradients. In this Application Note, a method for the analysis of metoclopramide and its impurities was transferred from a Waters Alliance 2695 LC to a 1260 Infinity II Prime LC. Excellent retention time and resolution correlation were obtained. Furthermore, the resolution was increased for most of the peaks. This Application Note clearly demonstrates the ease-of-use of ISET. No modifications of the instrument or changes of the analytical method were necessary for the analysis of metoclopramide and its impurities on the 1260 Infinity II Prime LC.